Voyager 2's view of Neptune, 57,000,000 kilometers (35 million miles) away. 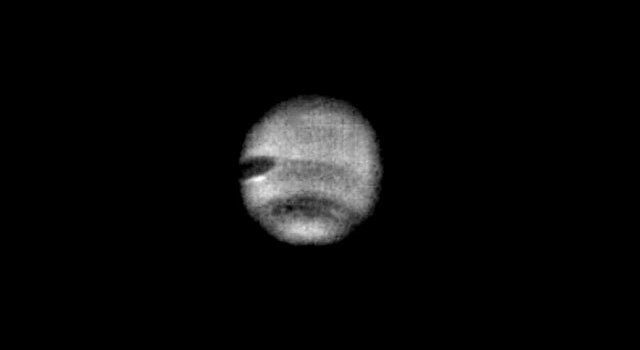 In the summer of 1989, NASA's Voyager 2 became the first spacecraft to observe the planet Neptune, its final planetary target. Passing about 4,950 kilometers (3,000 miles) above Neptune's north pole, Voyager 2 made its closest approach to any planet 12 years after leaving Earth in 1977. Five hours later, Voyager 2 passed about 40,000 kilometers (25,000 miles) from Neptune's largest moon, Triton, the last solid body the spacecraft will have an opportunity to study. Neptune is one of the class of planets -- all of them beyond the asteroid belt -- known as gas giants; the others in this class are Jupiter, Saturn and Uranus. These planets are about 4 to 12 times greater in diameter than Earth. They have no solid surfaces but possess massive atmospheres that contain substantial amounts of hydrogen and helium with traces of other gases. Voyager 1, launched September 5, 1977, visited Jupiter in 1979 and Saturn in 1980. It is now leaving the solar system, rising above the ecliptic plane at an angle of about 35 degrees, at a rate of about 520 million kilometers a year. Voyager 2, launched August 20, 1977, visited Jupiter in 1979, Saturn in 1981 and Uranus in 1986 before making its closest approach to Neptune on August 25, 1989. Voyager 2 traveled 12 years at an average velocity of 19 kilometers a second (about 42,000 miles an hour) to reach Neptune, which is 30 times farther from the Sun than Earth is. 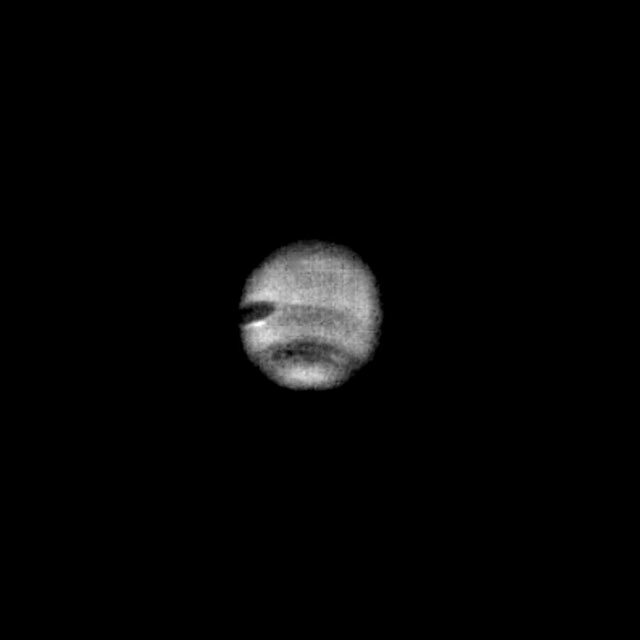 Voyager observed Neptune almost continuously from June to October 1989. Now Voyager 2 is also headed out of the solar system, diving below the ecliptic plane at an angle of about 48 degrees and a rate of about 470 million kilometers a year. Both spacecraft will continue to study ultraviolet sources among the stars, and their fields and particles detectors will continue to search for the boundary between the Sun's influence and interstellar space. If all goes well, we will be able to communicate with the two spacecraft for another 20 years, until their radioactive power sources can no longer supply enough electrical energy to power critical subsystems.